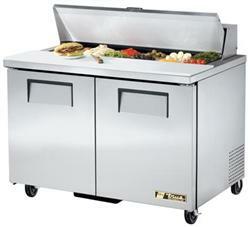 This True TSSU-48-12 Sandwich Prep Table has 12- 1/6 Size Pans And Would Be Great For Sandwich Shops And Grills! Comes standard with 12 ( 1/6size) 67/8"L x 61/4”W x 4"D (175 mm x 159 mm x 102 mm) clear polycarbonate, NSF approved, food pans in countertop prep area. Also accommodates 6" (153 mm) and 8" (204 mm) deep food pans (supplied by others).